Thanks for signing up to use GrabCAD Workbench! This guide will help you setup Workbench in minutes. The Workbench web interface shows your projects and all data uploaded to the Workbench cloud. All Workbench functionality is accessible through the web. The Desktop App and SolidWorks Add-In allow for easy syncing of your local files with Workbench projects. In addition to syncing, the SolidWorks Add-In has functionality to lock and unlock files right from within SolidWorks, as well as the ability to automatically generate PDFs for SolidWorks Drawings uploaded to Workbench. For an optimal Workbench experience, we recommend you use the Workbench Desktop App (and SolidWorks Add-In, if applicable) to sync your files and the web interface to access the full suite of Workbench functionality. The following steps will guide you through how to use Workbench, covering both the web interface and the Desktop App. 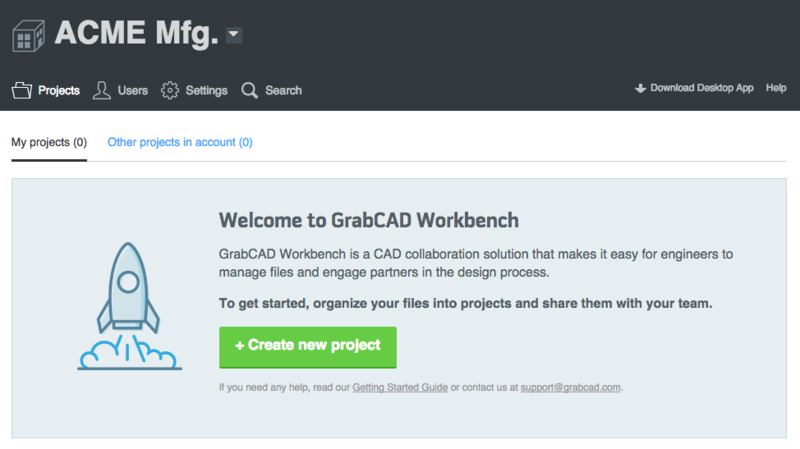 Log in to grabcad.com and head over to your Account page by clicking on "Workbench" in the menu at the top of the page. Click “Create New Project” and give it a name. Your project is totally empty, so lets get some files in it. You can do this in a number of ways, but the best way is to use the Workbench Desktop App. Click here to download: grabcad.com/downloadworkbench Installation will only take a few moments. If you are a SolidWorks user, you can also install the app to run from within SolidWorks. 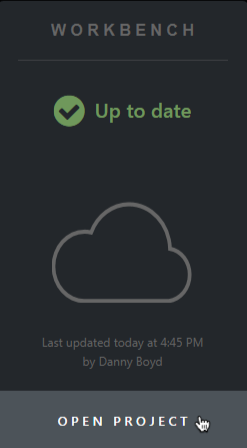 Once installation is complete, hit “Launch” and log in. Select a location for the GrabCAD folder where you will keep your CAD data. Be sure to choose a location on your local hard drive and not a network drive. To get in sync with the project you just created, click "Connect" and a folder with the same name as your project will be created in the GrabCAD folder. Take a CAD file and move it into this folder on Windows Explorer. You will see on the Workbench App that you have files to upload. Click to view them, and click "Upload Selected" to begin the sync. Make a small change to the CAD file and save the file. Don’t rename the file, GrabCAD keeps all old versions you have uploaded to the project. Notice that you have changes to upload to your project. Click Upload to view the list of changes, then click Upload to update the files in the project. You've just created V2 of your file. Let’s check out the file you just uploaded in the web viewer. Click "Open Project" to get to the Workbench project webpage. In the updates feed, you will see that you uploaded V2 of a file, and you can click “View Changes” to show the difference between the new and old versions right in the web browser. Click on “Browse All Files” to see that the contents of your project now match your linked folder. Now let’s invite your team. From the updates feed, click on the blue box that says “Invite Users” and enter the email addresses of the people you want to invite. They will get an email invitation to view your project. If they have not signed up for GrabCAD yet, they will see a quick sign up page and go right to your project. You and your team are ready to get going with your projects! If you'd like to delete the test project, click the Gear button in the top bar to access the project settings.